Our students need to write frequently, every day even if we can swing it. But at a typical student load of 150 or more students for each teacher, it’s simply not possible for us to read and respond to every piece of writing they do in our classes. Some simple math reveals this. Let’s say I spend 7 minutes on each piece of writing I look at to score (if necessary), respond to, and make some suggestions for growth (and you all know many pieces of writing take more time than this), I’m looking at 17.5 hours of time to do this for 150 students. Even if I did use every minute of my 8 hours of prep time per week to respond to ONE piece of writing from each student, I would still need to find 9.5 more hours that week beyond the school day. But honestly, I’m lucky if I can reserve maybe three of my eight prep hours per week for responding to student work–that’s also the time I need for planning, managing gradebook data, meeting with colleagues, dealing with email correspondence, going to the bathroom, and taking a few moments to just breathe. So most of that time to read and respond to my students comes out of my time beyond the school day. Properly staggered between my classes so I never get pieces of writing from all 150 students at once, I might be able to respond in detail to three pieces of writing per student per semester. And that is simply not enough writing for them to be doing. They need to write far more than this, and they need feedback so they can see how well their words are working to communicate their ideas to readers. Hence, I train my students to help with the feedback load. As I explained in an earlier post in this blog series, different from the other senior language arts class that I teach which is primarily a writing course, AP Lit is primarily a reading course. Everything we do should support students toward the ultimate task of the course: interpretive reading of complex literary texts. That means that the writing they do must provide practice in articulating their interpretive arguments. That means a lot of writing that looks like what they’ll have to produce for the AP English Literature and Composition exam: responding to a prompt to make an interpretive argument about a poem, a passage from a longer literary work, or about a novel or play as a whole. So my students complete umpteen timed writes in my class–every other week usually. (These are the more formal writing opportunities in the course–they write nearly every day in their writer’s notebooks informally as well.) The timed writes are all essentially “test prep” because I use either actual prompts from past AP Lit exams or prompts I’ve designed myself that look like exam prompts. But this is test prep that I support. The ability to quickly, concisely, and coherently make an argument about something complicated serves my students as thinkers and human beings. These are skills they will need in life no matter what they do. So for one class period every other week, we (including me) clear our desks except for some blank notebook paper and a blue or black pen and write for 50 minutes to articulate what we’re thinking about a poem, passage, novel, or play that we’ve been discussing. Writing is thinking. And these frequent timed writing experiences help us to hone it. This life prep is the actual reason we do it—it’s only a bonus that it helps them prepare for the AP Lit test as well. 1) Plan intentionally for which pieces of writing I will respond to and which ones students will respond to for each other. I do the feedback for all students on the first and last timed write of each semester so students and I can have beginning/end of semester data points to compare to look for growth. The Semester-Long Piece of Writing (SLPOW) was a multigenre piece of writing wherein students used the books we read together and that they read on their own to answer the question What Does it Mean to Be Human? The idea here was a place for some less analytical writing to pull together what our books had to say about the human condition. I asked students to write in at least two genres and got a range of awesomeness from poetry to fiction to dialogues between characters from different texts to psychological diagnoses of characters. One student even choreographed a dance and embedded the video in her paper and wrote to explain how it connected to her answer of the question. Notes in the gradebook on one student’s progress through the back-and-forth revision process. The “score” column lists the date I returned each revised draft back to the student for more work. The comments show the learning work the student focused on for each revision–content issues for the earlier revisions and mechanics to perfect things for the later ones. For the timed write revision–after students had done four timed writes in class, I asked them to pick one and revise it to make it better and then turn it in to me (see here for the instructions for this task). This would then start a back-and-forth process that could last for the rest of the semester where students would revise and I would give feedback and ask them to keep working until I thought a student had learned what the piece of writing had to teach. This enabled some individualized instruction, both in my comments to students on their papers and in the conversations we had about their revisions when needed. This was the place where I did my fine-toothed-comb feedback, intensely individualized to each student. Once we got past that initial March deadline, the continued revisions trickled in, a few per day, enough that I could usually respond to within 24 hours and get them right back to students to keep working on. In summary, there was frequent in-class timed writing to practice the kind of thinking and writing demanded by the AP Exam–most of these received feedback from peers. There was less structured, individual writing for the semester long piece of writing, giving students an opportunity to synthesize what they were learning and communicate that in a format that worked best for them. Some drafts I read and responded to and some got peer feedback, but in the end, the final draft got extensive response from another student in class as a key component of our final, culminating activity together. And there was intensive revision work on one piece of writing chosen by each student that I read and responded to, giving me the opportunity to individualize writing instruction for each student. 2) Talk about what makes for effective feedback. I find students are often wary of the value of peer feedback. They just want the teacher to read their writing. I help my students through this by reminding them again why I, one person, cannot possibly provide feedback on all of the writing they need to do and then giving them some strategies for providing feedback that helps writers. I provide a document that I ask students to tape into their writer’s notebook so they can use it as a resource throughout the year. It provides a couple of frameworks for approaching feedback and even some sentence starters for writing helpful, thoughtful comments. With some strategies that they all share, students start to trust that peers can be a legitimate source of feedback on their writing. 3) Provide tools to students to guide their peer feedback. The bulk of students’ feedback to each other was on our weekly timed writes, all essentially one type of writing: concise, well-supported arguments laying out an interpretive analysis about a piece of literature. As such, it made sense for us to clearly define the task and make sure we were all on the same page regarding what it meant to do this writing successfully. There’s already a rubric in existence for this writing–the AP English Lit/Comp 9-point rubrics for each of the free response questions on the exam are freely available, and they do a great job defining the task and describing what success looks like. For my students’ use, I’ve simplified the 9-point rubric into what I call the “General Rubric.” I give each student a copy to keep in their writer’s notebooks so they can interpret the 1-9 number score I give them on their very first timed write of the year and so they can provide a 1-9 rubric score to peers when they do peer feedback on timed writes. I also provide to students a Guide to Comments, something I picked up from the AP Summer Institute I attended last summer in Denver. I’ve adapted it a bit and want to do yet more work on it, but it enables for very quick shorthand response–just numbers in the margins–and students can consult the guide to comments to see what the numbers mean. Not only do these tools enable quick response for any reader, every time my students consult them to either figure out what a particular number means to interpret the feedback received on their own writing or to determine what numbers to leave on a classmate’s paper as feedback, they are reviewing yet one more time what we’re aiming for with this particular type of writing. They use the tools to complete peer feedback, and peer feedback becomes an ongoing conversation about how to be most successful at this particular type of writing. 4) Create ongoing opportunity for conversation about writing. My students sit in “response groups.” They are pods of three to four students clustered together for multiple “turn and talk” moments each class period. From “check in with your pod to see how the weeks was” to “turn to your people and talk briefly about how today’s timed write went,” I use the pods for ongoing conversation about the work of our class. With some concentrated effort on community building, I’ve seen these groups gel quickly, to the point where they are talking about their work with each other without my even asking them to. My students’ favorite pod-bonding activity is the group selfie. I’ll challenge them to head out in the school to find one place that they think somehow lines up with whatever we’re talking about in class that week and take a group selfie. I give them only 5 minutes. They post the selfies on our Google Classroom page, we scroll through them on the big screen and each group talks about why they chose their particular location in the school for their selfie, and I print the selfies out and put them on the wall behind each pod. Those few minutes of community building pay off when I’m asking students to read and respond to each other’s writing. They build trust as a group and are then more comfortable sharing their writing and having honest conversation with each other about it. Over time, they get to know each other as writers and naturally turn to each other for response. Of course I use these groups for the structured peer feedback moments in class, but informally they provide even more feedback to each other. There are times I do want my students getting feedback from beyond their response groups too. For instance, with the SLPOW as we were heading into the deadline for the complete rough draft, I planned a “speed feedbacking” event in class. Students would stand up and make two circles in the middle of the classroom. Each student in the inner circle would line up with each student in the outer circle. They would have one minute to scroll through (chromebooks in hand) their draft and explain to the other person what they had so far and what their plan was to complete it and then listen to the other person do the same. After a minute, the inner circle would rotate one person to the left and then the new pairs of people would do the same thing with their papers. After seven or so rotations, each student has had quite a bit of conversation with other students about their work and gotten a chance to hear from multiple other students about how they’re approaching the same writing task. Feedback doesn’t have to come to writers in the form of extensive margin comments in their writing. Conversation about writing is feedback too. Every year I find more ways to create opportunities for this. 5) Make time for peer feedback. Students will value what we spend class time on, and peer feedback is worth their time. Ideal is for students to do a timed write and peer feedback on it all in the same class period. I can use a 90-minute block period for this. They write. They read each other’s writing and use our rubric/comment guide to do peer feedback, then we talk about what they discovered about their writing. I made the mistake a few times of rushing the peer feedback by trying to shoehorn it into a 10 minute block of time. This only frustrated my students, which is a good sign. They were seeing the benefits of peer feedback and wanted to do it well. I find 20 minutes is the minimum amount of time for a decent peer feedback session–30 minutes is even better. They read, they comment, they talk to each other, they report out and we talk as a class. At the beginning of the year when I’m still training them, this all needs more structure from me, but by the end of the year, all they need is the block of time. 6) Show students how they can do feedback on their own. Students don’t always need a reader to find ways to improve a piece of writing, which is of course the goal of feedback. With a few strategies, students can examine their own writing to find ways to strengthen it. I have a box full of highlighters–pink, blue, green, and purple. We have a color coding key that we use for the entire year: pink = thesis, blue = body paragraph claim, green = data, purple = warrant. I frequently ask students to highlight their papers using this color coding key. A highlighted paper provides some immediate things to think about: the location of the thesis, an adequate amount of data, warranting that’s not very developed, an overly-formulaic paper, a paper with chaotic structure… I model this process early on with a piece of my own writing and think aloud to show them how I use it to find places to improve my writing. Another powerful strategy is showing students how to use mentor texts. On my Mentor Text Database that I’ve been building for a few years, I have a selection of strong AP-style essays, responses released from The College Board, as well as examples of literary analysis from contemporary publications that I put in front of them to challenge their use of the five paragraph essay–no reason they can’t break formula to find the best structure to support their intended meaning. Simply reading a mentor text and then doing some compare/contrast with their own writing can help students to see some ideas for revision. They need more help from me with this at the beginning of the year (modeling how a mentor text helps me think about revising a piece of my writing) and less as they get better at it. One of my favorite mentor texts to use with them is an argument about anti-intellectualism in our society all bundled up in an analysis of the TV show Friends. The thesis is buried about 2/3 of the way through the piece. It uses an analysis of a text to then make wider point about society. It ends with a list of suggestions. It has a few one-sentence paragraphs. It’s full of voice. It challenges their vision of what an interpretive analysis essay looks like, and that’s the whole point. And a quick note on grades: inviting students to break formula doesn’t work so well if their essays are graded traditionally. If the formula has always worked for them to get the grade that they want, they will be unlikely to try something different if it risks getting a lower grade. Students need room to take risks with their writing in order to grow–room where there are no high-stakes grade penalties as even a possibility. Sometimes the risks they take don’t work out so well, but they learn a lot in the process. Imagine if that risk came bundled up with a C grade on something? Would that student ever take a risk again? (Again, check out my blog series on grading for more information on my approach to grading and this post for a more extensive conversation about a moment from AP Lit where it became very clear why my no-grades approach to their writing is so important). One counter argument that pops up in my head when my students are writing things that I’m not going to be reading in detail myself is this: how will I know how my students are progressing as writers if I’m not reading and responding to everything? 1) I put data in the gradebook on everything they write. Gradebook data on one student’s set of timed writes. 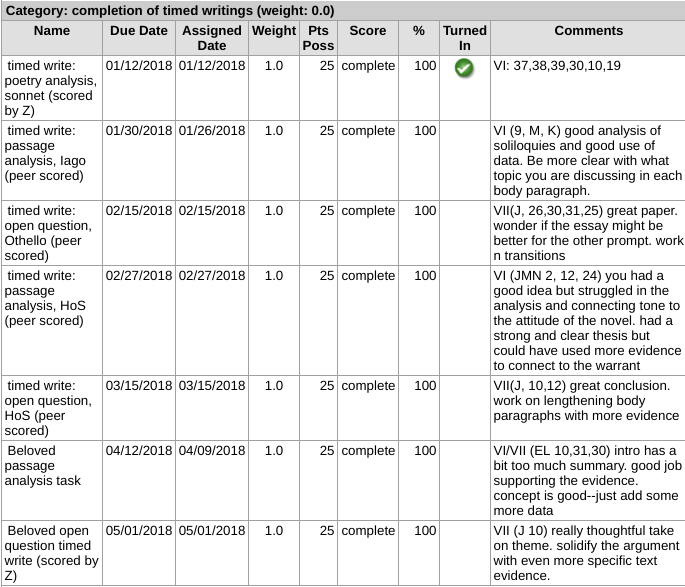 Except for in the case of the first and last timed write, the comments in the last column are the comments peers left on the student’s work and the scores and comment codes the peer reader selected. 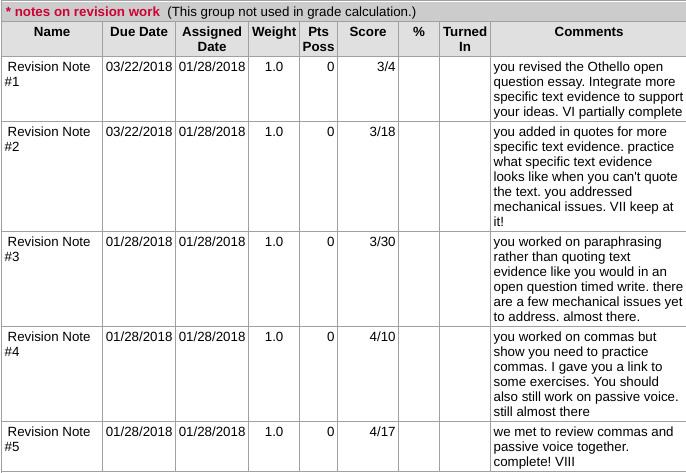 If I did the feedback on a piece of writing, I record in the gradebook the scores, comment codes, and some general comments I had about the piece of writing. If the timed write received peer feedback, I recorded in the comments box the scores, comment codes, and general comments that the peer reader determined for the piece of writing. I have the students write these things on a cover sheet that they staple to the timed writes that they read and respond to so my data entry is quick and efficient. So even though I have read everything in detail myself, I am able to record important data on each piece of writing that reveals both to me and the students how they are progressing with their writing. 2) I look over everything that they write. When I do the data entry described above, it gives me an opportunity to glance over every student’s work. I can learn a lot about how students are doing by reading the peer feedback comments and zeroing in on the places in the piece of writing that I might want to examine based on those comments. And I leave a few notes when it seems necessary to me. But mostly I’m glancing over to get a sense of how the class did collectively on a task so I can plan my next steps with my writing instruction, and I’m looking at individual students’ work to see where I might need to step in with some individualized instruction. But none of this takes me the same amount of time as reading/scoring/responding to every student’s piece of writing in detail. My data entry and review of their work for one class will take 30 minutes or less–something I most definitely can fit into my week without even having to take the papers home in most cases. Okay, I don’t look over EVERYthing that they write. I don’t collect writers’ notebooks where they are writing and thinking and responding to class nearly every day. I know many teachers do collect writer’s notebooks, and I respect that, but I choose to focus my time for response to their work elsewhere. The revisions mostly. I do monitor their use of their writer’s notebooks, though, and have them show me certain tasks completed in their writer’s notebooks frequently. Check my next post in this series for my efforts toward the AP Lit writer’s notebook. We need not be the sole feedback-giver in the AP Lit classroom. Our students can help, and it’s of great benefit to them to do so. Peer response/feedback in a community of writers is an anchor of workshop teaching–use it to help you manage the paper load in your AP Lit class. How do you work to share the feedback load with your students? This post is part of a blog series on teaching AP Lit with readers/writers workshop. Click here to see the entire series. This entry was posted in #WorkshopWorksForAP, AP Lit, blog series, grading, mentor texts, not grading, summer 2018 blog series, teaching writing, workshop teaching, writer's notebooks. Bookmark the permalink.